When our kids were much younger, the task of getting to church on time was our biggest challenge. In fact, there was a period when our middle daughter, six at the time, would only go to church wearing her favorite shoes—clogs. The service predictably started at the top of the hour, and we predictably showed up late. Our strategy was always to head stealthily to the back balcony. Blend in behind the choir. Our biggest obstacle? Walking up the wooden stairs with a clog-wearing daughter. Dear Lord Jesus, please ensure that our clog-wearing kid does not need to go to the bathroom so that we don’t have to walk those stairs again. The choir got to know us really well. Some of them smiled (cute kids). Others shook their heads (rotten parents). We were the late-arriving clog family. But we made it to church. And if you’ve been a parent of young children you count that a win. We fondly chuckle over those early church-going memories. As hard as those events felt back then, they feel easy compared to ways we have to navigate church with our teenage and young adult kids now. We still believe church matters. We believe that connecting with faith communities enhances personal faith. Our kids are becoming their own persons now. Making more of their own choices. Including church choices. And honestly, we don’t want them to go to church to please us or anyone else. We want them to go because they want to go for themselves. Through the hundreds of conversations my wife Jen and I have had with our friends and the research our FYI team has collected through our Growing With project, we’re learning a few things that have shaped the ways we talk about church with our growing teenage and young adult kids. Remember that, if your family has connected with a church community over time, these spiritual habits and relationships stick with your kids. Even in periods when your growing kids seem less interested in connecting with church, it’s still part of their story. Practicing faith has a tempo to it. Nothing fancy or profound. Just consistent. The parenting reflex, often fueled by tinges of fear, is to get angry or combative with our teenagers. We may blame them, shame them, or discredit their questions and assessments. In these moments the courageous, Growing With parenting move is to listen more and control less. Tweet: The parenting reflex, often fueled by tinges of fear, is to get angry or combative with our teenagers. In these moments the courageous, #GrowingWith parenting move is to listen more and control less. Listen to their questions and critiques while recognizing that their commentary is less about protest and more about ownership. They are starting to consider how your family’s churchgoing practice (your choice) now becomes their own (their choice). They need their own reasons, not just ours. Listening first helps parents ask better questions for fruitful dialogue. Our teenagers need our empathy, honesty, and support while they navigate their increasingly complex and stressful lives. Do not make going to church or youth group the hill you die on with older teenagers. In fact, too much focus on their church “attendance” drives short-sighted behaviors that only last as long as you shame or bribe them. Keep listening and remain consistent with your own church-connecting practices while they find their own paths toward church. Grow with them by helping them choose church for themselves rather than choosing it for them. Popular news stories do not help calm parents’ anxieties about their kids’ faith once they leave home for college, work, military, or a gap year. Often, stories of young people leaving church, walking away from faith, or ditching God are overplayed and create unfair and unhelpful perspectives. While it is true that post-high school young people typically attend church less, many adults misinterpret is why this is happening. Young people often feel overwhelmed with this new chapter in their lives don’t feel like they have time to commit to a church right now. So we encourage them to do less rather than more their first year out. Young people often are faced for the first time with choosing their own church rather than the church their parents chose for them. So we encourage them to take their time to experience different church expressions rather than rush into a church commitment. Some suburban churches are seeing fewer young people show up because many young people are moving to urban centers and are choosing not to own cars. So we encourage them to think more about how a church fits with the rhythm of their lives and values rather than church style or popularity. Many churches still hold Sunday morning services, which can be out of sync with most young people’s lives. So we encourage them to think about their own daily and weekly rhythms of work, play, and rest. Grow with them by broadening your church-oriented conversations in ways that that acknowledge their emerging life rhythms and values. I’ll still feel embarrassed or worried if my kids don’t “do church” the way I’ve done it. Back when she was young, my daughter loved her clogs and loved her church. Today, I believe each of our daughters love their lives and are satisfied with the ways they are finding faith and faith communities. I’m not only going to paint a pretty picture, though. Each of them has fallen in and out of church. Their reasons have been varied, multiple, and complex. As a parent, I’ll be honest—it feels better when they do go to church. But people attend and leave churches for all kinds of reasons. If we rest on whether they go or don’t go to church, we will miss their reasons, motivations, or spiritual quests. My wife and I realized we had to stop treating church like a quick-fix antidote that will solve all their spiritual challenges. That’s not what church is. Church fosters relationships as it pursues community with diverse lives. Like any relationship, a person’s relationship with church ebbs and flows through good and bad times, easy and stressful moments, or transformative and terrifying experiences. We have to remember that when we encourage our kids to attend church, we’re asking them to invest in an imperfect community that's filled with both possibility and limitations. What we know to be true and what we have experienced with our own daughters is that, while their church attendance varies, they are young adults who are seeking to make sense of their world, relationships, spirituality, and selves. Our goal is to engage in more nuanced conversations with them and let go of our optimism or pessimism over their church attendance. Grow with them by taking your conversations beyond church attendance toward the opportunities and challenges of living out their faith within community. 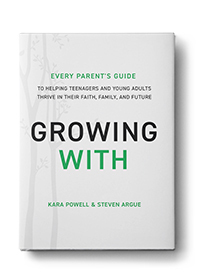 Tweet: Grow with your teen or young adult by taking your conversations beyond church attendance toward the opportunities and challenges of living out their faith within community. Church is not about clogs. It’s not even about attendance. Instead, allow your teenage and young adult kids’ winding roads of participation be less contentious and more an opportunity for you to grow with your kids through dialogue and discovery. Let it be a springboard for the significant conversations about life and faith everyone—young and old—longs for. Vern L. Bengtson, Norella M. Putney, and Susan C. Harris, Families and Faith: How Religion Is Passed Down across Generations (New York: Oxford University Press, 2013). Timothy T. Clydesdale, The First Year Out: Understanding American Teens after High School (Chicago: University of Chicago Press, 2007). Steven C. Argue, " Beyond “New and Improved” Youth Ministry: Fueling an Entrepreneurial Vision to Support Emerging Generations Where They Need Us Most,” Journal of Youth Ministry18:1 (Fall 2018). Emma Green, “It's Hard to Go to Church,” The Atlantic, Atlantic Media Company, 23 Aug. 2016, www.theatlantic.com/politics/archive/2016/08/religious-participation-survey/496940/. Steven C. Argue, "Undergraduate Spiritual Struggle and the Quest to Remain Faithful," Journal of Youth Ministry 16:1 (Fall 2017), 8-29.